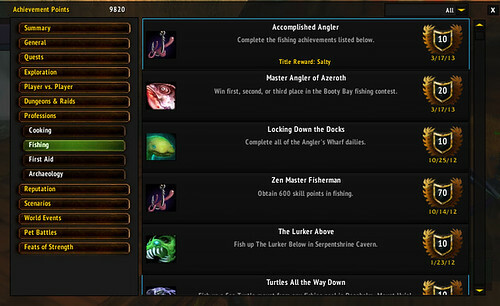 Today I talked Silenia into fishing in the Stranglethorn Fishing Extravaganza. A first, second, or third place win was the only thing standing between me and the Salty title. I doubted it would happen. We've been trying for a couple of years! The stars must have aligned for me today. I was super focused, and kept moving from pool to pool. Casting into the sweet spot as best as I could, I hit 39 out of 40 fish as they announced the winner. I got my last fish and started to hearth back to Booty Bay. My hands were shaking as I got my bearings in the inn. I knew I could get the second place as I talked to the Fish Master, but I had a choice of three rewards, and I didn't know which to pick! As soon as I saw a shadow fall next to me, I chose the boots and secured my second place win! In doing so, I also completed my Salty title. It has been a great day! I should have grabbed the ring as it binds to account and could be used by several characters. The teleport to Booty Bay will be pretty sweet though, and I am not going to complain! After some transmogrification, I ran to the orphanage this morning to pick up my orphan. He is the cutest lil guy! Very inquisitive. First, we went to the great chasm near Sentinel Hill in Westfall. There are choppers you can rent. Second, we went to see King Magni, who has strangely turned into a diamond. Third, we traveled by boat to Darnassus to see Malfurion Stormrage. Now, we are getting ready to fly kites and eat ice cream. What a day this has been!